This week’s photo challenge is Blur. I rarely keep a blurry photo, as I always go for the picture that has better quality. Usually my cell phone takes blurred images. Some are noticeable, while others aren’t as noticeable until after I’ve posted them on my FB or Instagram pages. However, this one is my favorite blurred image. It’s of my daughter, shopping for a comic book. 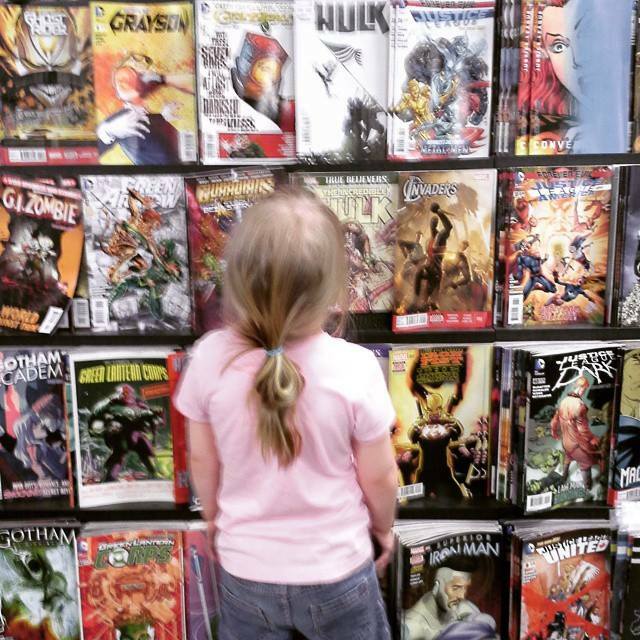 She’s staring up at Hulk, her favorite superhero; there’s two different stacks of Hulk comic books so, she’s trying to decide which one she wants. She loves superheroes and comic books. There’s a lot of girl’s who read comic books, they’re not just for boys. A few years ago she found my small stack of comic books; I had a huge stack of them, once upon a time, but they had gotten stolen while I was in the Navy. I found her thumbing through them carefully and mumbling intelligible words, which only had me believe that since she can’t read just yet, she’s making up her own story lines. Suddenly, I thought ‘maybe she would like to have them, if not help me pick some out that she would like’. Now, when we go to Hastings, the only store nearby that has a large selection of comic books to chose from, she always asks if she can get one. Of course I say yes, it makes my little geek heart leap for joy. This entry was posted in Photo Challenge and tagged Arkansas, ASD, author, Author Jennifer Adams, author Jennifer N Adams, authors, Autism, Autism awareness, autistic children, Benton Arkansas, blog, blogging, blur, books, bookstores, children, children with special needs, children's book author, children's books, Children's literature, comic books, comics, creative writing, daughter, friends, geek, geeky heart, girl's like comic books too, Hastings, Hulk, kids, Marvel, moms, parents, photo-challenge, photography, sensory processing disorder, single mom, single moms, single parent, single parents, SPD, Special needs, superheros, Weekly Photo Challenge on April 11, 2015 by JenniferNAdams.